For me Portofino was a love at first sight. I remember the excitement I felt when I was in the car traveling and waiting to arrive, like I'm going to meet a very dear friend, enjoying every little bay we passed by, after every curve my hart was going faster and faster. Finally I was there! We stopped the car and we started to walk. And there it was - a fairytale. Narrow streets, colorful little houses, small shops, for now you¡¦ll think nothing special or different from other small towns in Liguria, but you¡¦ll be terribly wrong! This place has a character and spirit like no other in the world. Just in the end of the main street a piazza appears. From here you have this breathtaking view to the little port where boats are just lying on the water, tired from a long sail, so cozily sheltered on the crystal water. Then you just look up and see a an image and you know you can never forget. Houses hidden behind gorgeous green trees, so perfectly matching with the surrounding nature, that I was thinking how it is possible human to do this, it looked divine in every sense. We turned right and continued our walk just next to the boats and looking at the majestic castle on the top of the hill, surrounded by deep forest and beautiful gardens. When I was a kid I have always imagined that sleeping beauty had exactly the same castle. We started to climb to the top, till we reached the castle, walking between the trees hidden from the burning sun just breathing fresh air. From time to time you are actually able to watch the sea somewhere behind the trees. We passed by a cave where water was running. When we made it to the top, we walked through the gardens. The most exquisite shapes and colors appeared and an amazing view to the sea. On our way back we stopped to see the Church of San Giorgio, on right hand side was the sea. The church seemed like a brave soldier standing there all alone, ready to fight no matter what, between spacious see from one side and the wall of the castle from the other. 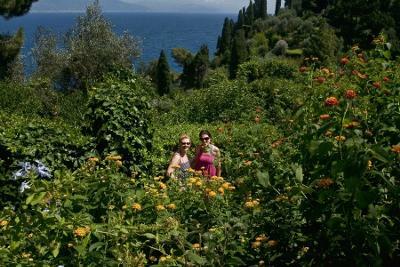 In the end Portofino is a wonderful place with many emotions which are making the spirit of the town through the years and apart of the vanity and luxury you can really fell and enjoy something that fills the soul with beauty. 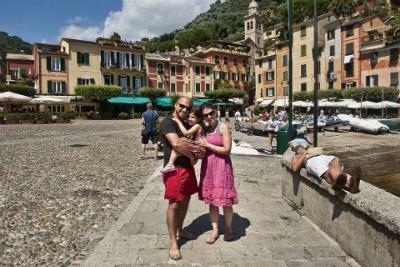 Thank you Liguriaguide.com for making this visit possible, you just made one dream come true. Join in and write your own page! It's easy to do. How? 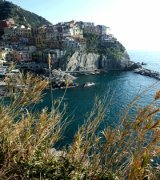 Simply click here to return to Liguria Photos Visitors.